A beaver cruises a northern Mane pond. Expert engineers, beavers are not alway welcome guests by property owners who may lose ornamental trees or experience flooding thanks to the animal's natural activities. But beavers are also responsible for creating necessary wetland habitats in Maine. When it comes to looking for a new home, beavers are not ones to ask permission before setting up housekeeping in the ponds or streams of Maine’s small landowners. It is not at all uncommon for the aquatic, fur-bearing mammal to move into a small pond or along a waterways running through a yard or field. Given that beavers are often referred to as “nature’s engineers,” thanks to their dam and lodge building skills, Dill said the bucktoothed critters do a great deal of good for woodland ecosystems. That sort of ecosystem design can be an upside for landowners, according to Shawn Haskell, Maine Inland Fisheries and Wildlife regional biologist based in Ashland. Haskell said he and fellow biologists have spent some time recently in the field looking for the Rusty Blackbird (Euphagus carolinus), which has experienced a population decline in recent years and is not all that common in Maine. That can be a real boon for property owners, Haskell said. 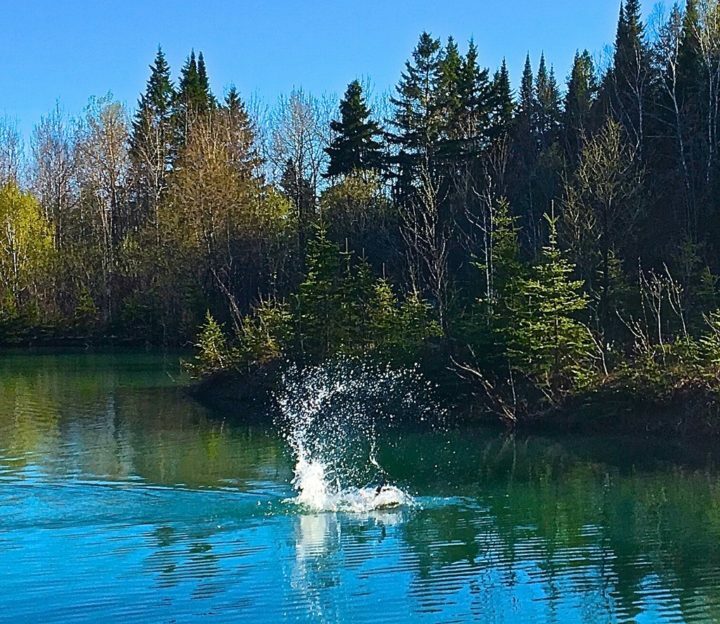 Beavers alert other beavers to threats or dangers with a characteristic loud tail slap which sends up a splash of water before the animal dives below the surface. Overall, Dill said, beavers tend to be good neighbors until they decide to help themselves to an ornamental tree buffett. If the beavers overstay their welcome, landowners do have some options. Dill suggests wrapping the trees’ trunk with galvanized metal fencing or chicken wire to prevent the beavers from chewing the bark. He said there are also chemical deterrents on the market, but the success of those products is somewhat debatable. Larger landowners, like paper companies, often call in help when beavers block culverts which then overflow and wash out roads. Haskell said. The state will also issue special permits for landowners to shoot nuisance beavers, Haskell said. There are occasions, Haskell said, when what is a welcome wildlife guest for one landowner is a nuisance to the abutting landowner. “Basically we work with the neighbors to solve any issues and we are lucky in Maine in that in cases where one person wants the beaver but a neighbor wants it gone, they work it out,” Haskell said. Flooding became a major issue for the town of Orrington in 2012 when a beaver dam on private property burst and washed out a public road, causing $125,000 in damages and sparking a lawsuit between the town and the landowners. Beavers are quiet animals that tend to keep to themselves, but Dill said if you know what to look for, you can determine if one or more has moved into a pond. In addition to construction dams across moving water like streams or rivers, beavers construct domed-shaped “lodges” out of tree limbs, sticks and mud for their homes. Beavers eat the tree bark and seem to be most fond of popals within 100 feet or so of their lodge. “Of course, their favorite is going to be any tree you just planted,” Dill said with a laugh. Beavers are not considered dangerous, though they will become aggressive if cornered or otherwise threatened. The beavers’ main defense seems to be the characteristic “tail slap” in which the animal loudly smacks the surface of the water with its wide, flat tail sending up a spray of water before it dives beneath the surface. “That seems to be a ‘distraction’ tool the beavers use to frighten the perceived threat and to warn other beavers there is danger nearby,” Dill said. 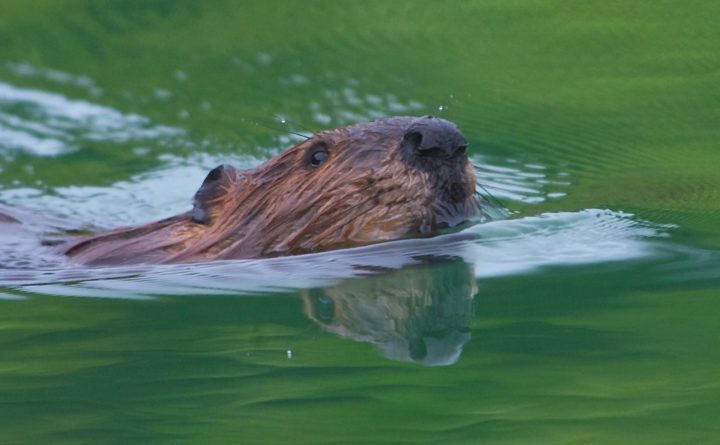 The biggest risk to a resident beaver population, Dill said, is the fact they carry and pass along the parasite responsible for spreading giardia which can infect humans and other animals with abdominal cramps, nausea and diarrhea. Love them or hate them, Haskell said it is impossible not to admire their work ethic and construction skills.